Dun Briste is a truly incredible site to see but must be visited to appreciate its splendour. Dún Briste (Gaelic for Broken Fort) was once joined to the mainland. The sea stack stands 45 metres (150 feet) tall. Click on the image for a higher resolution. 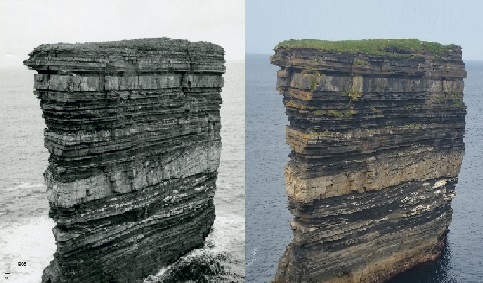 Incredibly, some loose rocks located at the top left of the 1968 photograph are still there 47 years later. The 1968 image is taken from the book 'The Road to Downpatrick' by Donal McCormick. A large piece of rock at the top right of the image (approximately 4 meters square) has broken away. Amazingly, this event was witnessed and the resulting splash photographed by Olivier Lerebourg which can be viewed here. As the stack is safe from any land based predators, it is a safe haven for a vast array of bird species at nesting time. Occupied by Common and Greater Black Backed Gulls, Kittiwakes, Cormorants and Puffins.